Ronnie Barker was a much loved British comedian who was also a prolific comedy sketch writer. Much of his comedy was based around an incredible verbal dexterity and some of the most famous sketches were puns about mispronouncing words. Barker’s Moon was conjunct Jupiter in Gemini opposite his Sagittarius Ascendant showing an instinctive feel for language and the ability to expand it into something truly funny. Barker had the Sun in Libra a sign that generally functions best in a cooperative venture with an equal partner, so it is most appropriate that the work he was best known for was a collaboration with fellow comedian Ronnie Corbett. The show that made him was the Two Ronnies, which was shown on the primetime TV slot of 8 pm on Saturday evening, and ran from 1971 to 1987 with viewing figures of 20 million at its peak. Pluto was conjunct Barker’s Sun from Nov 1971 – Jul 73 showing this to be the watershed moment of his life. Barker’s big break in TV came on the Frost Report in 1966. Pluto was in square to his ascendant from October 1964 to August 1966. 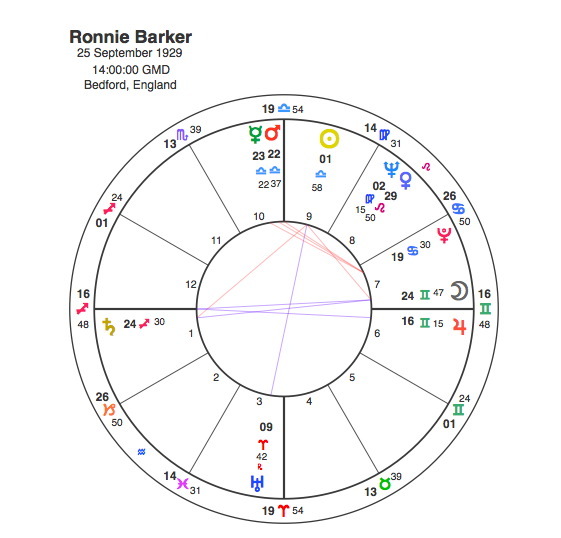 Ronnie Barker died in October 2005, when Pluto was opposite his Moon. The most important points in any birthchart are the Sun, Moon and Ascendant. The next in line would be the ruling planet, in Barker’s case, Venus which was appropriate as Pluto was conjunct his Venus from September 1956 to May 1958. He met Joy Tubb in September 1956 and married her in July 1957, they were together for almost fifty years until his death. Barker’s first radio appearance was also in 1956. The Ascendant ( because of its association with sunrise ) rules the morning, the Sun rules the day and the Moon rules the night. Pluto’s transits to these three marked his breakthrough, his peak and his signoff. To amend his catchphrase Pluto was good morning, good day and goodnight from him.